Aid Training has provided courses for those wanting to become an expert in skills, or further their abilities at work for 17 years. As well as offering over 100 courses such as food safety, fire marshalling and first aid, they also help employers train their staff. The courses are delivered by specialists to ensure a large quantity of knowledge about specific subjects, to help users become experts in their field. 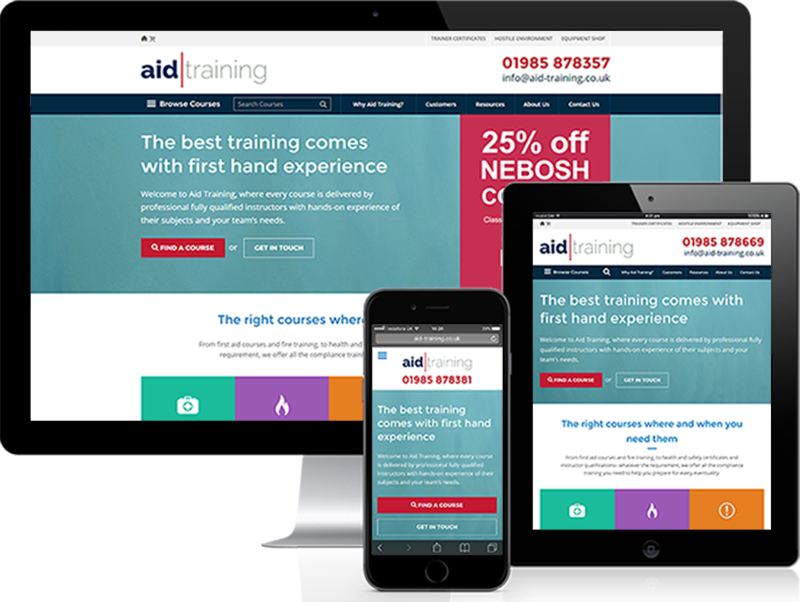 Aid Training’s old site needed an update and we were asked for a bespoke new site that retained the style and feel of the old site so as to stay loyal to the brand. We were asked to make it entirely in Drupal- the same as the old site- so that no days would be wasted retraining staff to use a different back end. Through our edits we needed to increase Aid’s site visits, conversion rate, and their google analytics goal completions, which mainly involved users filling out sign up forms. 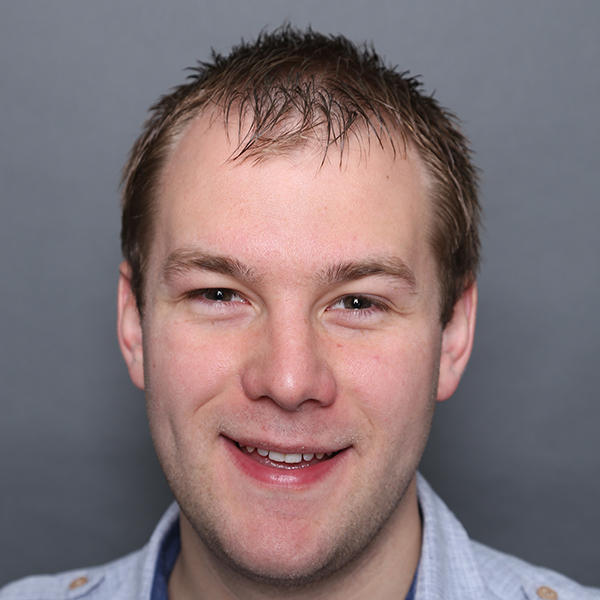 We began looking around other popular course booking websites to find a winning formula for usability. Meanwhile, our developer on the job researched available Drupal modules and investigated the new content required. 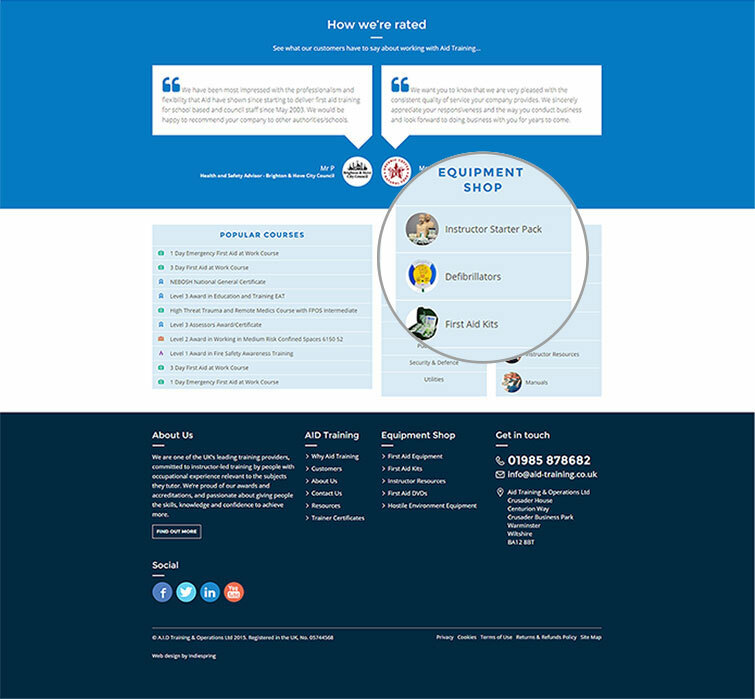 Also on the team was our dedicated designer, tasked to build a completely bespoke set of templates based on Aid Training’s request to have the new site similar in style to the old one. Each of the four team members working on the site were researching simultaneously in order to allow plenty of time for testing later on. We mapped out Aid Training’s existing sales process on Lucid Chart. 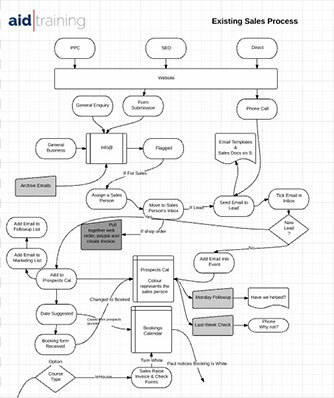 The flow-chart like diagram helped us to understand exactly how the new site needed to be laid out and where the processes could potentially go wrong. 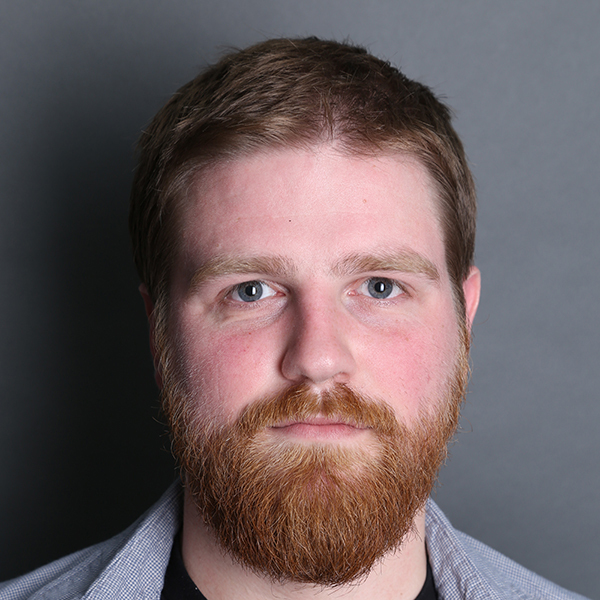 Using this tool allowed us to pay close attention to those areas where users may get stuck and figure out how to go about changing the site to stop them becoming a problem. Designer Andy Bellass worked with Project Manager James to produce hand- drawn wireframes of the proposed site, which were then translated into digital content with Axure. 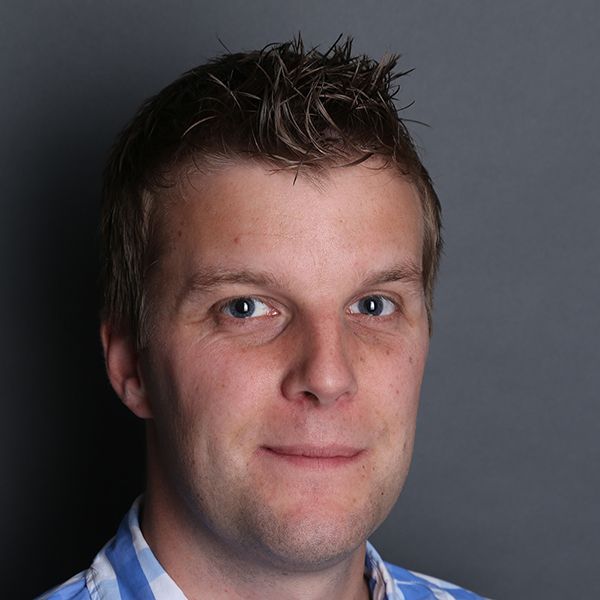 The wireframes were then passed onto developer Rob who combined them with his work in drupal. When this was finished, the staging site was tested and sent live, and aid-training.co.uk was reborn. Browse courses drop down gives users rapid access to the bulk of the website in one click. 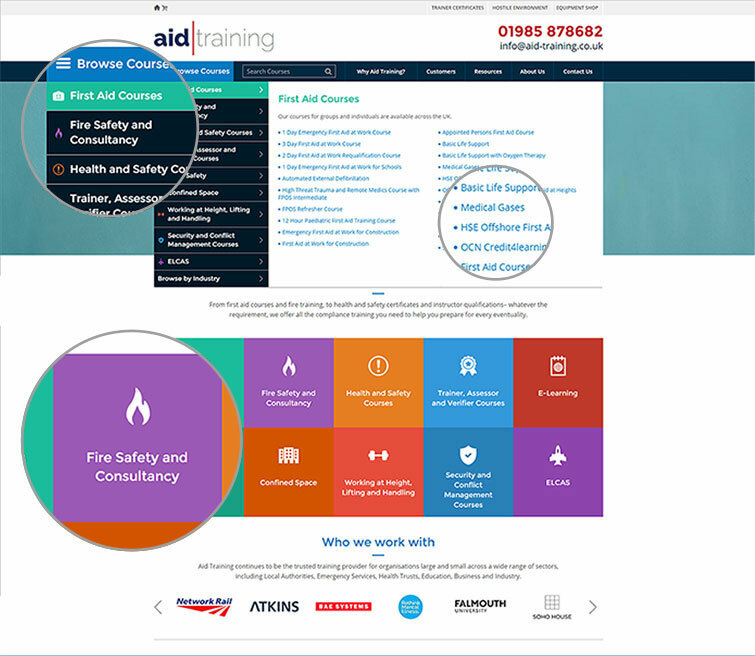 Instant access to the most popular courses from Aid Training. Built in equipment shop widget appears on all pages to provide greater exposure and increase sales. 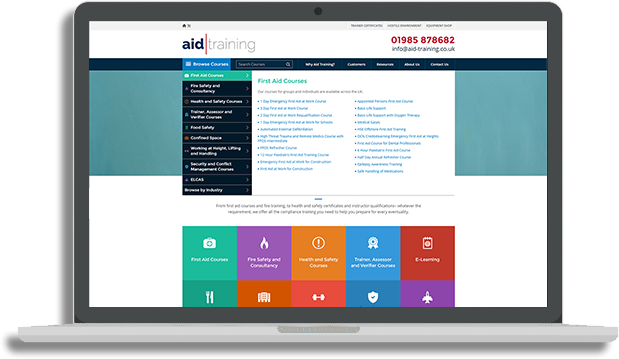 Only a few days after the new site was launched, Aid Training’s conversion rate was up by 53.67% due to the improved usability and new design. 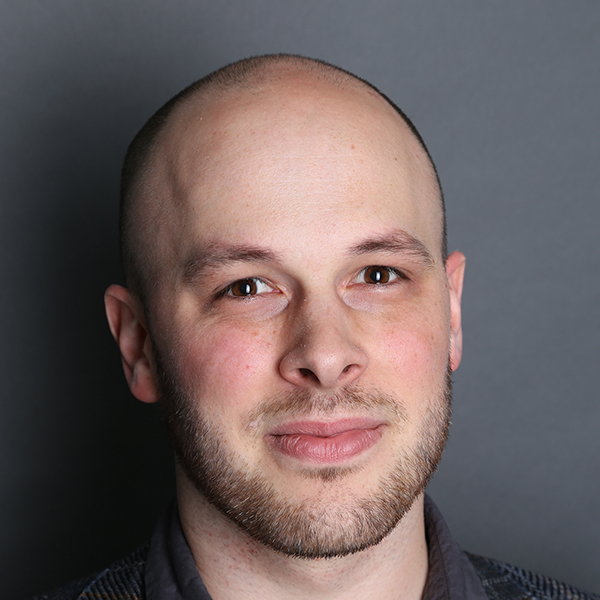 The Google Analytics goal conversions for the site, which included mainly form completions, were up by 57.14%, meaning there were plenty of new customers. The redesign also greatly enhanced the website’s search engine optimisation resulting in organic visits increasing by 16.73%.